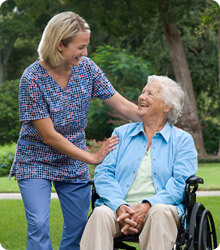 Columbia Convalescent Center has been providing care and compassion to its residents and their families since 1991. Our 119-bed, state-of-the-art facility provides skilled and intermediate care on a long-term, short-term, respite and hospice basis. Built on a foundation of trust and family values, Columbia Convalescent Center strives to reach its goal of complete resident satisfaction by providing dignity, comfort and individualized attention to each and every one of our residents. Located in Columbia, Illinois, our facility has been serving those in need in the Metro East and South St. Louis communities for close to two decades. Columbia Convalescent Center is consistently ranked Above Average by the government's Medicare Nursing Home Compare. To read the complete Medicare Nursing Home Compare report on Columbia Convalescent Center, click here.